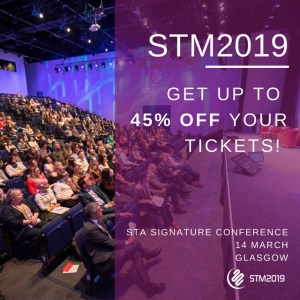 As a member of the Institute of Hospitality, you will receive up to 45% off the price of your ticket for the Scottish Tourism Alliance Conference 2019 but you have to be quick! Super Saver Early Bird tickets numbers are capped and available for a limited period only, after which tickets will revert to full price. Next year’s conference will take place on 14 March at the SEC in Glasgow and will for the first time ever, follow a TED-style format running from 10am – 3.45pm. An evening warm-up networking reception will be held on the eve of conference and the STA is also partnering ScotHot for the third time, bringing delegates a range of additional learning opportunities through the Spotlight Stages and of course, the largest exhibition for Scotland’s tourism and hospitality industry. This is the ‘do not miss’ national conference for all tourism businesses – click here to find out more and secure your place today before all tickets fly! The discount period will end on 30 June.